I made an early start under the bluest of blue skies to ride the Monts de Blond. As I crossed the Vienne through St Junien, I could tell it was going to be a warm one, and by the time I crossed the N141 that runs from Limoges to Angouleme I had already taken my gloves and armwarmers off. I was now on the main road to Javerdat, floating along on fast super smooth tarmac it seemed effortless, and judging by the roadies that I saw I wasn’t the only one who liked this road. There were more roadies than cars. But don’t get the wrong impression, along the whole 8km stretch I only saw three cars, but I saw five roadies. At le Pont Ã¡ le Planche I turned left and headed up through Fabrique. I don’t know why, it wasn’t on my route, I just did, and anyway, I love the climb up through the village, as it skirts the Forét de Brigueuil. Detour over, I continued on through Javerdat and onto Villeforceix. This next section of road onto Boscartus was gorgeous, the birds sang, the early morning air felt clean and fresh, and I felt good. The road started to climb around the side of the hills opening up great views. I promised myself half a banana, and a short rest when I reached the top. The village of Villerajouze was very pretty, looking like a place that time had forgot, real picture postcard French rural. Two kilometres further on, and I reached the highpoint, time for that banana. I had been on the road for just over an hour, now it was time to get off it. On the map I had spotted a trail that I liked the look of running to the North East. I managed to find it easily enough, and a couple of minutes later I was riding some superb singletrack down a steep hillside in fear of my life! So I slowed my stoopid self down a little, best be a little bit sensible as there was no one around, I only had a vague idea of my location, and would have put money on my moby’s display as ‘no signal’. Dropping down to a road the track turned into a stream, but a nice one with sparkling clear water, and a rocky bed, I splashed on through. Straight over the road I picked up a VTT FFC sign (French Federation of Cyclists MTB route), for routes 5, 6, and 7. Now I know all these routes start and end at the mtb center in les Mas, and it was roughly in the direction I wanted to go, so I followed it. For the next couple of hours I followed route 5. Some great off-roading ranging from wide open tracks through technical rocky descents, to ball breaking climbs. By the time I reached the old Chapel above le Mas I was starting to feel a little jaded. I decided to stop for a while, eat a chewy bar, and enjoy the views. The Chapel sits in a clearing on the top of the hill, you can’t drive to it, it’s a lovely spot, and just like the last time I was here I had the place to myself. I sat in the shade for 10 mins and enjoyed the tranquility. Forgot to say that in all the offroad I had seen four horses, and two walkers! As I raced down the hillside into the hustling bustling mtb mecca that is les Mas I saw three people. The cafe was open, and I stopped for coffee. True to form, I was tired, and had no food left. With just enough money to buy a coffee, I reckoned that if I filled it with sugar it might just give me the boost I needed to get home. It was good and strong, I polished off the sugary sludge in the bottom of the cup with a spoon. So, one coffee later I was back on the tarmac heading for home. This is where the real work began. If you haven’t been to the Limousin before, I can tell you that it is lumpy, and it punishes tired riders who have no self-discipline. As you hit each rise the temptation to crash down through the gears and grovel you way to the top is immense. Luckily there was a roadie or two heading in the same direction as me. I used them to help me hold my form, riding each hill properly, and finishing each crest going up a gear to get the bike moving. Through Cieux, then Oradour-sur-Glane, and crossing the N141 again, with 3km of downhill into St Junien, and just one hill left to climb home I had 5 hours in the saddle, and was congratulating myself on a great ride. 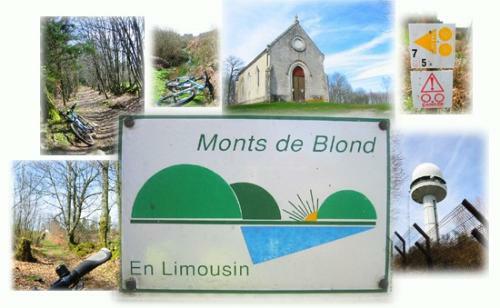 This entry was posted in ride reports and tagged Monts de Blond, training, VTT by stratobiker. Bookmark the permalink.